Join us for our next Let's Connect on Monday, May 27th at Fleming's! We are pleased to have Sandrine Ferdane, CEO of BNP Paribas Brasil, to talk about "Why invest in Brazil? Challenges and opportunities". Sandrine began her career at BNP Paribas Group in 1992, where she held various positions in Structured Finance both in France and Brazil. In October 2014, she was appointed CEO of Banco BNP Paribas Brasil, one of the largest international banks in the country, with R$ 44 billion in assets and activities in Corporate and Institutional Banking, Private Banking and Asset Management. Sandrine is also the Head of the Brazil Territory which, besides the bank, includes the insurance company Cardif; Cetelem, specialist in Consumer Finance and Arval, fleet manager of vehicles. In total there are 1700 employees in the Group, of which 700 are Banco BNP Paribas employees only. 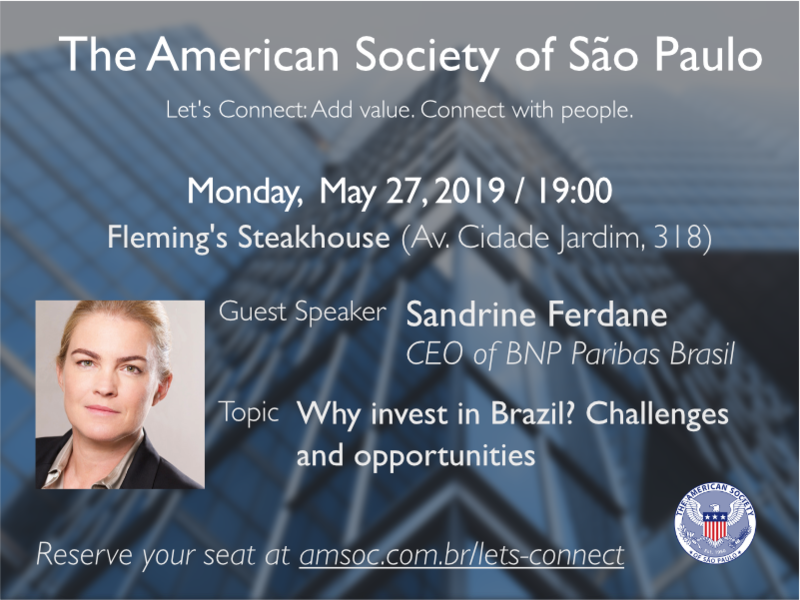 Sandrine is a Member of the Board of Febraban, Vice-President of the France-Brazil Chamber of Commerce and Member of the G100 of the BNP Paribas Group. We are looking forward to hearing more about Mrs. Ferdane's history and views about the future. The Entrance Payment is mandatory and includes food and beverages.